Most urinals I encounter have the same basic shape. Every once in awhile I come across a really new or really old design. The newest ones Ive seen are waterless and have some sort of chemical in the bottom that is lighter than pee. So the pee sinks and the chemical stays on top sealing out the horrors below. What, Biff doesn’t have a jetpack? If you can make it there, you can make it anywhere. Finally, American potty-ers have put a little symbol on urinals (I’ve seen a shell, in blue), to give guys a target. The Dutch figured that out years ago, putting the image of a realistic fly on the ceramic, which cut _way_ down on misses and cleanup for the janitorial staff. 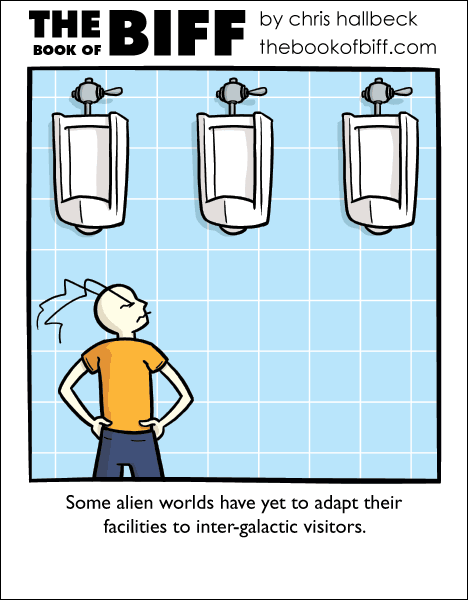 Either those aliens are really tall, or they don’t pee from the same spot humans do. When I was in grad school, they had weird “Female Urinals” in half the stalls of the women’s rooms. They were some kind of weird urinal/toilet hybrid with no seat. I tried using one once, when all the toilet stalls were occupied. They were very strange and uncomfortable, and for some reason a few inches taller than the toilets. I’m not sure who thought that one up. Chris’s comment at the bottom simultaneously reminded me I wanted to look up how waterless urinals worked and explained how they did.